The 42" brackets have been upgraded for increased height and better rigidity. The 42" brackets have been upgraded for increased height and better rigidity. Using the new mounts is just as easy as ever though and you can still retain your rubber bumper stops. 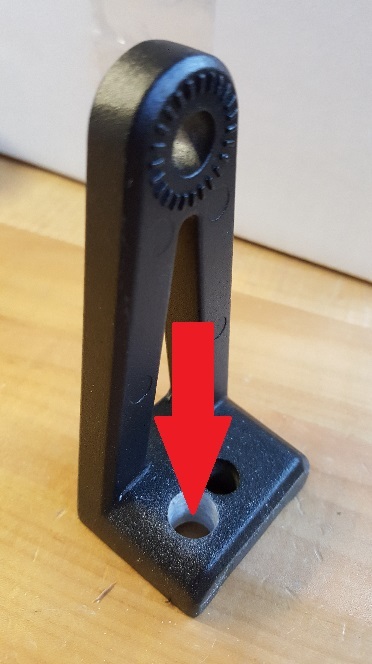 Simply use the front hole location (the front hole should be closest to the front of the truck) to install using the included hardware. *Note: You will need to remove the star bolt and the white grommet from the bumper pad unit. This will allow room for you use use the much larger bolt to secure your 42" bar bracket. Below is an example of an unfinished pre-production model to give you an idea of which hole to use. The hole located in the center of the mount is for custom install locations etc.